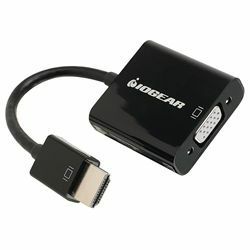 IOGEAR's HDMI to VGA Adapter is a convenient and cost-effective solution that instantly connects your digital sources to a projector or other external analog monitors in stunning 1080P. The adapter connects to the VGA cable of your device (VGA cable not included). Works with Apple® TV, Roku®, Blu-ray players, other media players and laptop or desktop computers with HDMI output.